Newly-minted professional Antti Törmänen 1P will play an exhibition match against Hajin Lee 3P on OGS this Saturday, January 9, at 11p EST (4a UTC). 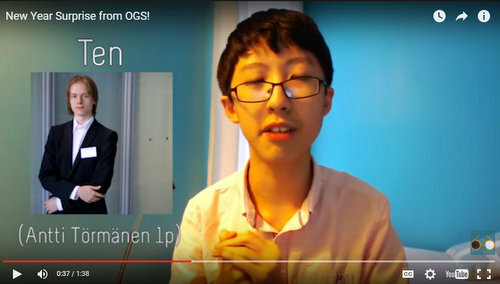 Lee, a Korean 3P and secretary of the International Go Federation, is well known to western go players for her entertaining and instructional YouTube channel, where she’s known as “Haylee.” Antti Törmänen is the first Western player to be granted professional status by the Nihon Ki-in since Hans Pietsch in 1997. He offers paid lessons on OGS and publishes a blog chronicling his go career. Calvin Sun, North American 1P and Stephen Hu, AGA 5 dan (right) will provide live commentary on the game. Click here to see a promotional video for the match on YouTube. To watch the game and commentary, log into OGS and click on the banner links posted at the top right of the page.